When Jesus quoted Reagan about a city upon a hill, He wasn't talking about Civ V. Losing a windmill and a hydro plant makes no sense at all. I find that hills are a good choice for one's capital on higher difficulties. When superior forces come knocking at your door, that extra strength is a lifesaver. Hydro plants are cool, but only if you survive long enough to see them. I'd rather have a fortified unit on the hill, thereby blocking one route for enemy forces to melee attack and breaking line of sight for a ranged as well. This would also extend the zone of control a little further out, thereby slowing their charge a little bit more. I will admit that relative to the river it's pretty defensible, since it can have a line of defenders along it before enemies reach the city itself. 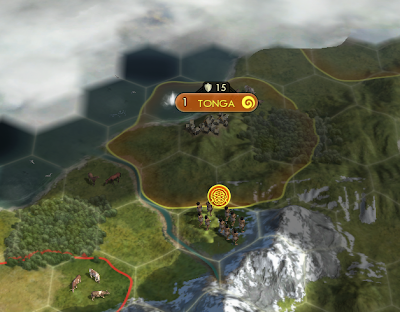 With the mountains to the west they have an excellent choke point. And that's why 1upt is so amazing. I could use a lesson from you guys. I just don't have fun with Civ unless I'm winning by peace though that also means I have to be a strong defender at higher difficulties. I'm a softee like that :) Though ...Klep I could use a hand with a combat guide. I wrote a beginners guide but it lacks a combat section. You good enough to instruct some beginners? Its strictly a beginners guide. Its on Steam at the following link: http://steamcommunity.com/sharedfiles/filedetails/?id=122860723 some players have asked me to add sections on combat and while I understand it, it's not the kind of game I like to play. I had planned to just put together a defensive guide since that's more my expertise, but some offensive input would be grand :) Let me know if you'd like to contribute to it.